Ambassador Thura Thet Oo Maung of Myanmar delivers a welcoming speech to the guests. Among the guests in attendance were Deputy Foreign Minister Yoon Soon-gu for Political Affairs and many foreign mission chiefs. Among them were Ambassadors Peteris Vaivars of Latvia, Stephan Auer of Germany, Daul Matute-Mejia of Peru, Khamsouay Keodalavong of Laos, Sripriya Ranganathan of India, Yip Wei Kiat of Singapore, Raul Hernandez of Philippines, Umar Hadi of Indonesia, Fernando Danus of Chile, Long Dimanche of Cambodia, Nguyen Vu Tu of Vietnam, Chaim Choshen of Israel, Mihai Ciompec of Romania, Andrei Popkov of Belarus, Adalgisa Maria Soares Ximenes of Timor-Leste. 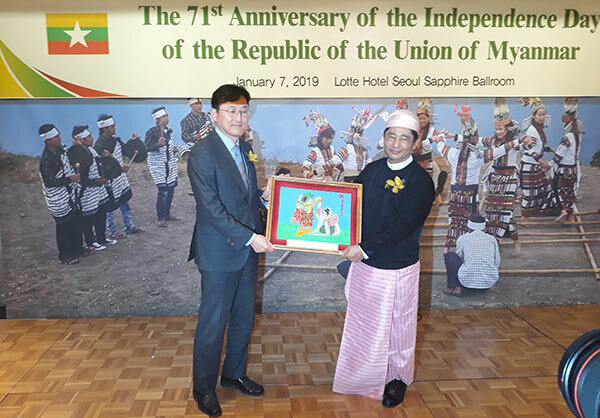 Ambassador Thura Thet Oo Maung of Myanmar (right) presents Deputy Minister Yoon Soon-gu of Foreign Affairs for Political Affairs with a framed picture of Myanmar. It is my great pleasure and honor to welcome you all the distinguished guests present here today to the reception in commemorating the 71st Anniversary of the Independence Day of the Republic of Union of Myanmar. 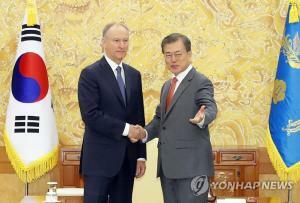 I also would like to extend my sincere gratitude to Deputy Minister Mr. Yoon Soongu and Deputy Minister H.E. 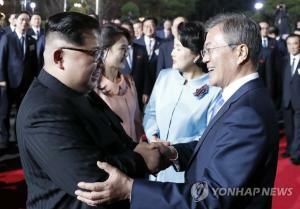 Jang Jae Bok for his kind presence on this auspicious occasion which demonstrates the existing friendly bonds between Myanmar and the Republic of Korea. First of all, I would like to explain Myanmar’s Independence Day background briefly. The people of Myanmar had lived in successive kingdoms of magnificence and dignity for millennia. However, Myanmar becomes a colony in the late 19th century when the colonialism had a strength influence all over the world. Throughout the colonial period when Myanmar Lost its independence and sovereignty, all national people took up arms and fought for independence with genuine patriotism and Union Spirit which led to regain the country’s independence and sovereignty on 4 January 1948. 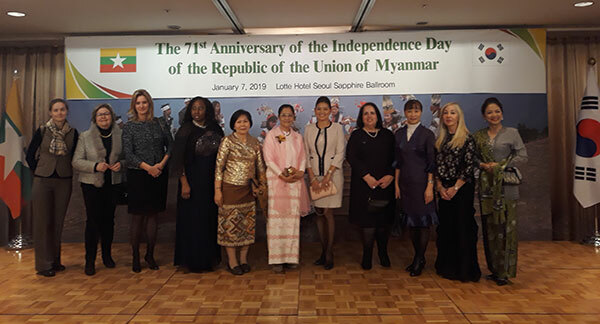 This year, 4 January 2019, marked the 71st anniversary of the Independence Day of the Republic of the Union of Myanmar. Ambassador Maung of Myanmar (8th from right, front row) poses with the Korean government representative and other ambassadors. 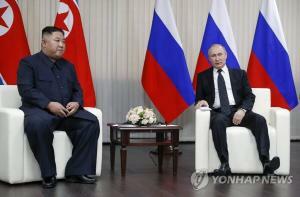 Myanmar and the Republic of Korea established diplomatic relations on 19 May 1975. Since the establishment of bilateral relations, Myanmar and the Republic of Korea have strived to strengthen the relations on all fronts. 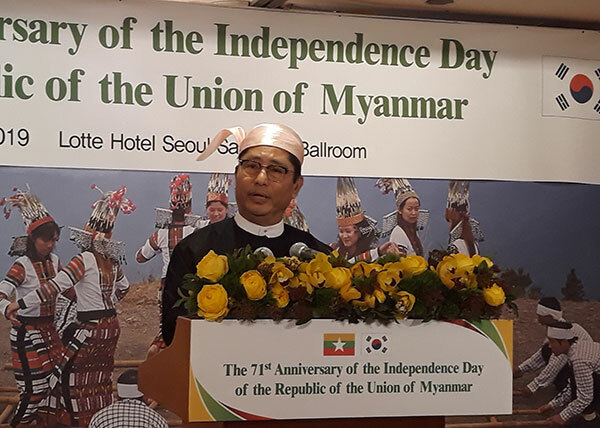 Looking back on the two countries’ diplomatic relations in the past, Myanmar and ROK have strong ties not only in political, but also in economic, social, cultural and religious context. 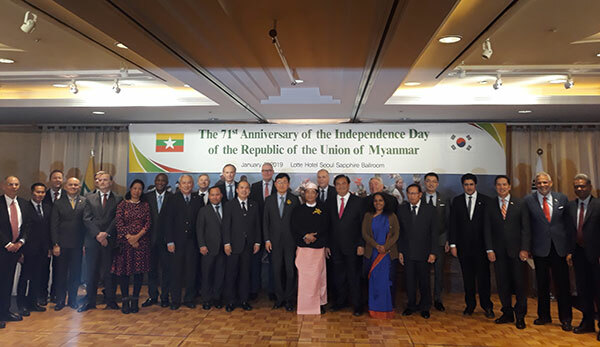 Exchange of visits between Myanmar and ROK at various levels render great opportunities to promote friendly relations and cooperation between two countries. Myanmar delegation led by U Thaung Tun, National Security Advisor, Union Minister for Investment and Foreign Economic relations paid an official visit to Seoul from 19 to 22 December 2018 and met with South Korean Trade Minister Mr. Hyun-Chong Kim and discussed to promote the economic cooperation and investment matters between the two countries. Mrs. Nang Lao Ngin (6th from left), spouse of the ambassador of Myarnmar in Seoul, poses with the spouses of other ambassadors at the reception. In April 2018, South Korean Trade Minister Mr. Hyun-Chong Kim also paid a first minister level official visit to Myanmar since President Moon Jae-in took office. During the visit, State Counselor Daw Aung San Su Kyi received Trade Minister and exchanged views of enhancing the existing economic relations including the promotion of trade and investment, sharing technology and know-how and the potentials for establishment of industrial zones in Myanmar. 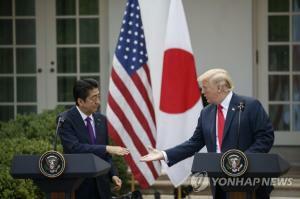 Now with the current Korean Government’s new foreign policy initiatives, I believe that President Moon Jae-in’s “New Southern Policy” which aims to strengthen cooperation with India and ASEAN countries with the 3p pillars building a community of People, Prosperity and Peace will also become a huge drive to boost the relationship with Myanmar. 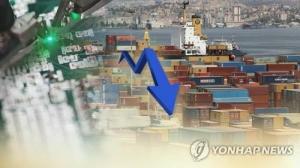 Since Korea Government is emphasizing to strengthen diplomatic and economic ties with ASEAN countries, Korean entrepreneurs are also seeking new opportunities in ASEAN region. Myanmar is currently a very new player in the market economy scene. Recently, at ASEAN Business and Investment Summit, State Counselor Daw Aung San Su Kyi stressed reform measures that have been undertaken to create a more attractive, investor-friendly environment and she also pointed out the importance of responsible to welcome our Korean Friends to invest in Myanmar, in such priority sectors as labor intensive industries, agriculture and livestock industries, export promotion industries, import substitution industries, power sector, education services, health care industry, affordable housing projects and establishment of industrial estates. 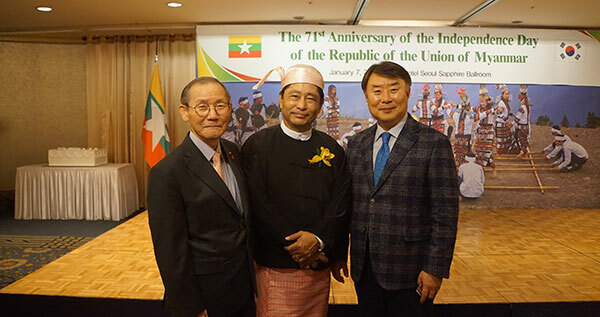 Ambassador Maung of Myanmar is flanked on the left by Publisher-Chairman Lee Kyung-sik of The Korea Post and Director Yoon Joo-mok of The Korea Post (religious affairs) on the right. Recently, Myanmar granted visa exemption to South Korean tourists since 1 October 2018 as a one-year trial with a move to attract more visitors to Myanmar. As a result, there has been an increase of 30% in tourist from South Korea after launching the visa exemption scheme. I would like to take this opportunity to invite my Korean Friends to visit Myanmar to see our natural and cultural beauty. The relations between two countries have been growing stronger and the government of ROK provided its development assistance to Myanmar. 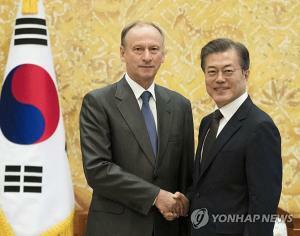 On 24 December 2018, Senior Economic Advisor of the Republic of Korea and Chairman of the Presidential Committee on new Southern Policy H.E. Kim Hyun Chul attended a ground breaking ceremony to launch construction of the Myanmar-Korea Friendship Bridge with assistance from a loan of Korea’s Economic Development Cooperation Fund. It is a great contribution to facilitate better transportation and trade flow among Yangon and other regions in Myanmar. This Bridge will be a historic landmark in our bilateral relations and cooperation and we appreciate the Korean Government’s assistance in the development process of infrastructure in Myanmar. Before I conclude, I would like to take this opportunity to express my heartfelt thanks to all distinguished guests for your kind present this evening out of your busy schedules. I also would like to extend my deep appreciation to my colleagues and friends for their kind support to this event.